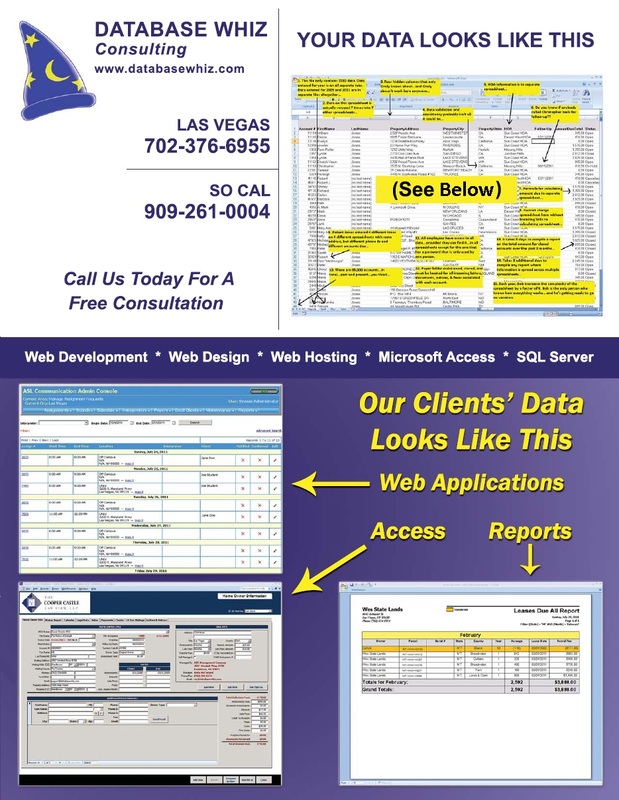 Based in Las Vegas, Database Whiz Consulting offers Microsoft Access programming, SQL Server programming and administration, web programming, web development, and web design for the small to medium-sized business. Your company’s most precious asset is its information. Without proper or efficient access to your information, most companies are dead in the water. Paper files, spreadsheets, and Word docs may ultimately get the job done, but all are inefficient means of accessing your information internally and/or sharing it with others. Thus, virtually every company needs good software to help store, manage, and process their information and daily transactions. Database Whiz Consulting has a local presence that allows us to work face to face when necessary with our clients. We are not an agency sending programming work offshore to India, the Philippines, or Eastern Europe. We come to meet with you in person to learn about your business and to gather your needs. Still, we also have the ability to easily manage and maintain applications for clients outside of our local areas without the time difference and language barriers many encounter when dealing with offshore development companies. In addition to Las Vegas, Database Whiz Consulting also has clients in Southern California, throughout the Inland Empire and Orange County, Phoenix AZ, Atlanta GA, Boise ID, and Milwaukee WI. 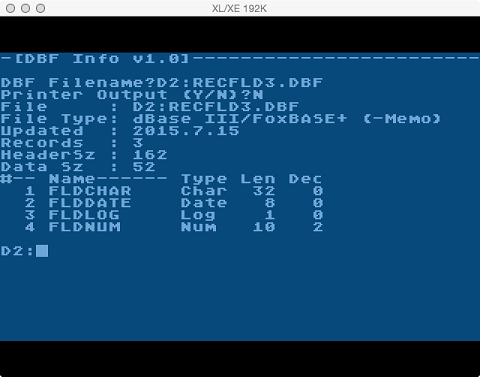 If you are using an old, antiquated computer system to manage your company data, we'll build you a better one. 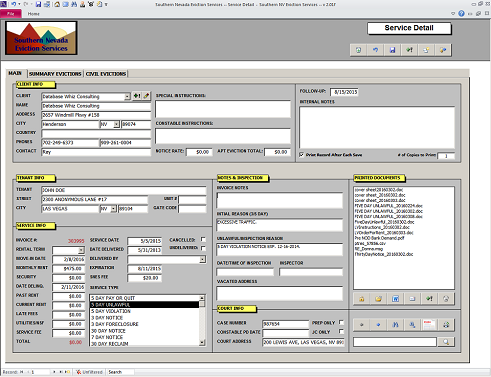 If you are doing all of your paperwork and data handling manually, we will make your life easier. If you have a spreadsheet or word document for each of your company records and keeping things straight is getting out of control, we will save you. If you find it difficult to gather your company data into reports that are quickly created and easy to read, we will take away your frustrations. The popularity of spreadsheets in today's business environment is understandable. They're easy to use and an easy way for everyday users to calculate new data based on other data. 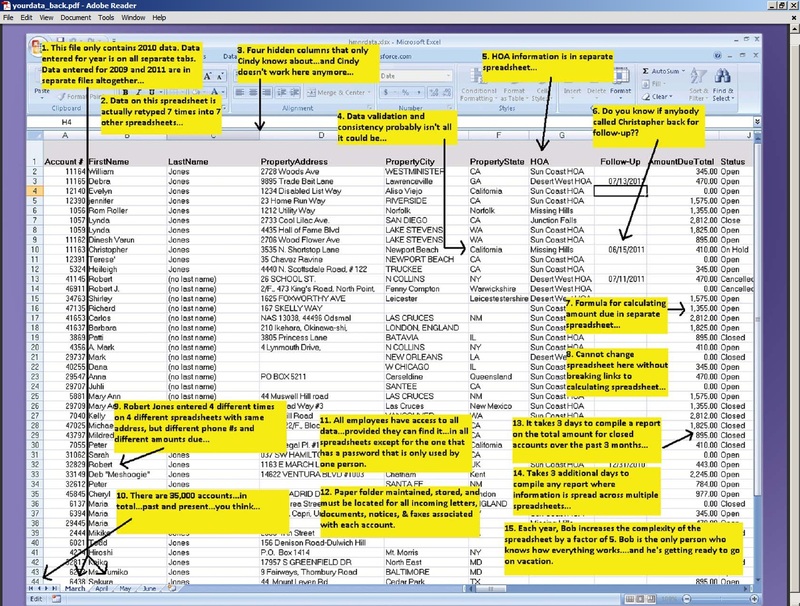 However, ever try to consolidate data into a report from 50 or 100 spreadsheets? Ever have trouble finding the data you're looking for? Ever try to control employee access to data with your spreadsheets? How about emailing or printing labels for all of your clients from spreadsheet invoices? Database applications make all of the above a snap. Run reports with the click of a button. Easily search for records. Control employee access with username and password logins. Easily mail merge your contact info into letters and/or mailing labels.